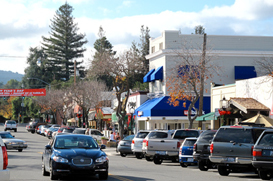 Los Altos is a commuter town, or bedroom community, at the southern tip of the Peninsula in Santa Clara County. Located 40 miles from San Francisco, Los Altos has strived to keep the rural feel that many residents have looked for. There are tight regulations on shops and business, limited to the commercial zones of downtown and certain business parks along the Foothill Expressway. There are two public school districts, which are the top employers in the City, as well as a number of well-praised private or religious schools. The population remains under 40,000, with many upscale neighborhoods. Many of the ‘tech elite’, from Apple’s Steve Jobs to Yahoo’s Jerry Yang, have made their homes here at one time or another. Real estate prices range from about $1million to $1.2 million for a 2 bedroom home, with an average list price of around $2.25 million.